Wilderness survival skills blog covers everything from outdoor survival to survival food including winter survival, wilderness survival shelters, even survival kits. 1. Step One - Locate a good spot. Seeing how there wasn't very many trees around, here's a spot that has logs and a few sticks to use as a frame and bark for the roofing. 2. Step Two - Build the frame. 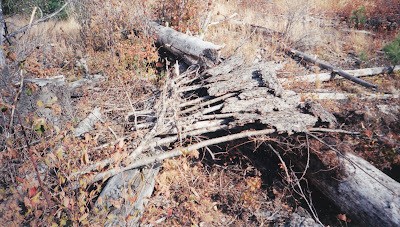 Logs make a good main frame and the sticks fill in the rest. It's hard to see but there's a good slope to the left for the roof to allow rain to run off. 3. Step Three - Cover the roof with bark using the shingle method. 4. Step Four - Put down some bedding like pine needles or pine bows, then make a small doorway and climb in and enjoy. 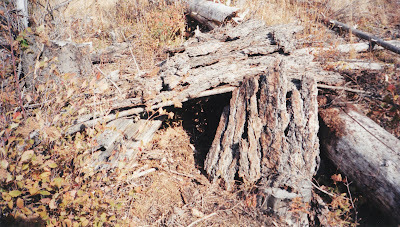 This shelter was a good example of building in an area with fewer trees and using bark instead of pine bows. 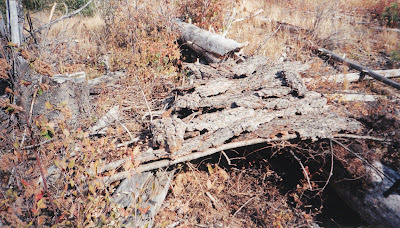 Note: Remember to take a look at the posts on "wilderness survival shelter criteria" and "3 components of a dubree hut" to see all the steps and check if this student followed them. "Please notify me of any new posts"
This site is for information purposes only. The information provided herein reflects only the opinion of the authors. Wilderness-Survival-Skills.org assumes no liability for the use or reliance upon any material contained or referenced herein. While we make every effort to ensure the accuracy of the information provided, we assume no liability for errors or omissions. 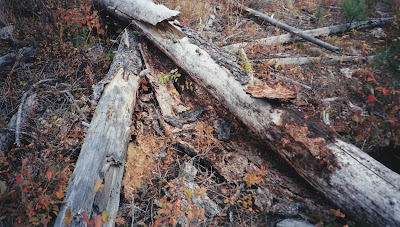 While participating in Wilderness Survival Trips be aware of certain risks and dangers that may occur. These risks include, but are not limited to: Survival injuries, hypothermia, frostbite, asphyxiation, high altitude illness, snow blindness, entanglement, insects, animals, cuts from knives and other sharp objects, burns from fire, trauma from striking objects or other people, injuries caused by other people’s actions, rough terrain, falling, hazards of traveling in the wilderness environment, accidents, illness, the forces of nature, and unusual or unexpected events. When venturing into a wilderness environment it is the individual's responsibility to have the proper training, information, equipment, and experience to travel safely. 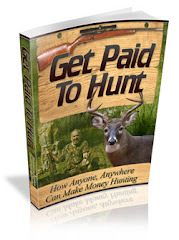 Financial Disclaimer: We do make money when you click on the advertising on this site. It's how we pay for all the time, effort and resources that go into this website. We also make money on some of the products we review and endorse, but others we don't, it just depends on the product.